Looking to take your workout to another level? This is the story of SBG Athens coach Lee McMichael. Lee felt like he was in a rut before joining SBG Athens. He says that he found SBG Athens due to being an MMA fan. 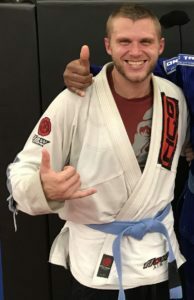 He knew that the gym had spawned Forrest Griffin, and living nearby, he wanted to see what the gym had to offer. According to Lee, the gym has much more to offer than he would have anticipated. Don’t quit! Even if you can’t make it to as many classes or do as much as you want. Just keep coming back! Don’t take it too seriously, especially early on. Make this something you enjoy doing, not a chore that you must do! Talk to people! Early on I did not do a good job of putting myself out there and making connections at the gym. We are a welcoming place but the gym and its’ people can only do so much. Do you struggle with some of the same things with which Lee struggled? You CAN make that change and TRANSFORM your life also! Fill out the form below and one of our coaches will call you back as soon as possible. This is SBG, you will be okay. This is the story of Josh Norris, SBG Athens athlete and assistant coach. Before coming to SBG, Josh felt literally lost. From ages 18 to 24, Josh had lived in ten different places in five states. One of his parents had passed away, and the other disappeared from his life. “I had lost my family by blood, family by bond, the structure that was high school and my literal home,” Josh says. Lacking structure in his life, he says “chaos took its place.” He ended up in Athens by chance, just another stop on his journey. He now owns a home and enjoys a stable life. He feels like he’s regained a sense of family at SBG that was missing for a long time. Regularly attending classes at SBG has Josh feeling stronger at 185 lbs than he did weighing 205 lbs and working out in a traditional setting. He feels stronger, more patient, and has the confidence that goes with acquiring skills that he knows work. He has to test them in sparring on a regular basis. In so many ways, Josh is thankful that he found SBG. I cannot tell you all of the benefits you will find at SBG but I can tell you that in one way or another, you’ll become an even better version of yourself. Everything you put into SBG, you will get back in some form. Whatever your goal, we can help you reach it. If you think you can’t do it, you can and you will. You will have fun, you will be safe, you will learn amazing skills and you will enrich your life. The only catch is you have to earn it, but each and every step of the way you will have a Tribe by your side, working together to become the best possible version of ourselves. Do you struggle with some of the same things with which Josh struggled? You CAN make that change and TRANSFORM your life also! Fill out the form below and one of our coaches will call you back as soon as possible. This is SBG, you will be okay. Are You Lost in the Weight Room and/or Lacking Self Defense Skills? 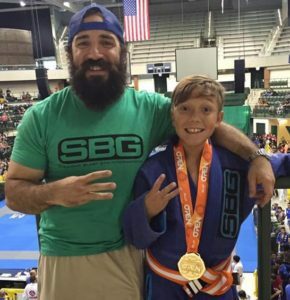 This is the journey of Lucas Federico: GM of SBG Athens, Kid’s Coach, and BJJ Brown Belt. Before joining SBG he was lost in the weight room, unmotivated, and lacking self defense skills. Lost in the weight room, Lucas went through the routines and motions, but without direction or understanding didn’t know how those things were helping him. Finding motivation to keep going and the subsequent lack thereof became the main reasons he couldn’t keep up with a routine. Having worked in bars in a college town, Lucas was concerned that lifting weights wasn’t the way to learn how to defend himself and keep me from getting his a$$ kicked. He said, “That’s going to sound like the thoughts of a crazy person, but having worked in bars in a college town you find yourself surrounded by people looking to ‘beat their chests’ and going to the gym had it’s own sub culture of ‘tough guys.’” He got tired of being in the weight room surrounded by people thinking they were tough just because they had big arms. It was in 2006 that Lucas began working with a bunch of college kids that were learning the fairly new sport of MMA. “It sounded pretty intense and had piqued my interest”, he said. They had all told him he would love it and would fit right in. After a few weeks of waiting for one of the guys to bring him by the gym he got in his car to drive over and check the place out. Lucas has been at the gym ever since and it has transformed his life in every aspect possible, and all for the better. He is a more confident, relaxed, focused, and happy individual than ever before in his life. He is surrounded by some of his closest friends and family and benefits from being a part of one of the greatest social networks around. “I get to live the life others dream of because I wanted to learn how to defend myself. Learning MMA and Brazilian Jiu Jitsu has been a long road, but one I wouldn’t change for anything,” he continues. I have been at the gym since 2006 and my life has transformed in every aspect possible, and all for the better. I’m a more confident, relaxed, happy and focused individual than I have ever been in my entire life. I’m surrounded by some of my closest friends and family and have one of the greatest social networks because of this “gym”. I get to live the life others dream of because I wanted to learn how to defend myself. Learning MMA and Brazilian Jiu Jitsu has been a long road, but one I wouldn’t change for anything. Take baby steps and enjoy the journey. Any transformation worth a crap takes time and sacrifice, but if you focus too much on the destination you’re going to miss out on all the other great benefits a place like this has to offer. So many long lasting friendships have been forged inside the walls of this academy. I always hate seeing people miss out on that. Stay consistent in your training. Even on days when you are sore, come in and jump on the mats. Last piece of advice I’d like to offer, BE COOL! Want to challenge the limitations you set for yourself? Amazing stories of transformation from members of the SBG Athens Tribe.